There are seven elite ancient marathoners who have set a marathon age-group world record at age 60 or greater, and in addition, have recorded times ranked within the top 15 in their current age band on multiple occasions spanning more than a decade. These seven elite marathoners with extraordinary staying power are John Gilmour, Eric Ӧstbye, John Keston, Derek Turnbull, Luciano Acquarone, Ed Whitlock and Yoshihisa Hosaka. John Gilmour migrated from Scotland to Australia during childhood. He was a keen athlete in his teens but at the outbreak of the war enlisted in the army and became a prisoner of war when the Japanese over-ran Singapore in 1942. He was imprisoned in the notorious Changi prison and subsequently shipped to Japan where he experienced further extreme privation. He suffered permanent loss of much of the sight of both eyes due to malnutrition. His pièce de résistance as a slave labourer was destroying a major Tokyo Steel furnace by contriving to have a heavy naval shell loaded into it. He sustained his spirits with the hope of future athletic achievement and within a year of his return home represented Western Australia in national championships. However, his most memorable performances were achieved in international masters events ranging from 800m to marathon over a 20 year period from his early 50’s to age 70. At age 59 he ran a marathon in 2:38:19. Three years later he set a world M60-65 record of 2:41:07 and subsequently in Perth in 1989 he set a M70-75 world record of 3:03:04. He continued to race and to coach until in his mid-eighties. Ӧstbye was born on Norway but moved to Sweden. He dominated Swedish road racing in the late 1950’s and 1960’s, but rarely ran on the track. He set his first age group world marathon record in the 45-50 category at age 47 and subsequently set records in the 50-55; 55-60 and 60-65 categories. Even at age 70 his time of 3:15:57 placed him 10th on the world ‘all time’ list at that time. In 1968, he was not included in the Swedish team for the Mexico Olympics because he was considered too old at age 47, despite a best time of 2:20:55 that year. It is interesting to note that Mamo Wolde won the Olympic gold with a time of 2:20:26, though the altitude of Mexico City (2250m) must be borne in mind. Ostbye trained according to the principles of Ernst van Aaken. The key feature was daily long slow runs of 30 Km or more, in the low aerobic range, augmented by only a small amount of fast running. He was also a dedicated vegetarian. Keston is an English actor and singer who travelled to Washington, and thence to Broadway, with the Royal Shakespeare Company in a touring production of the play, Sherlock Holmes, at age 50. He decided to remain in the US. 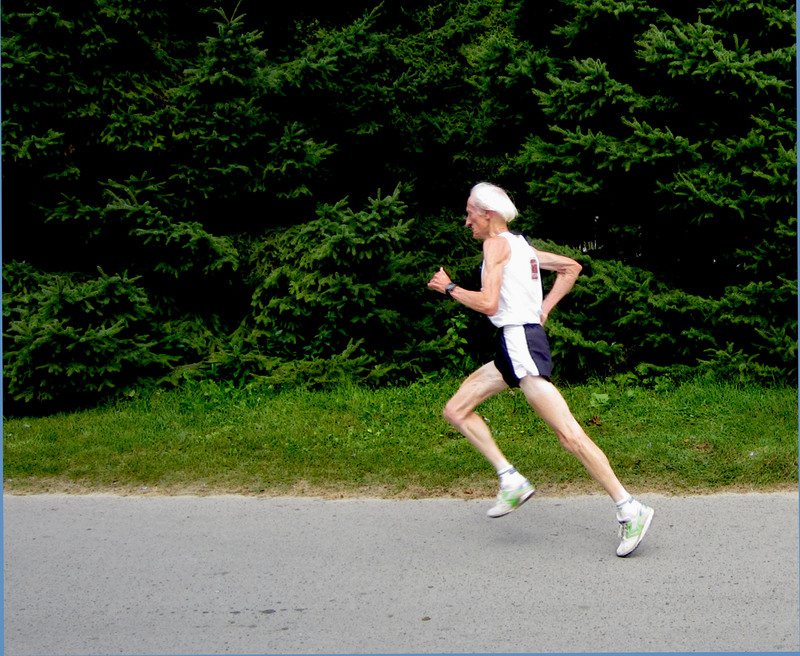 At age 55 he took up running to overcome high blood pressure. After doing well in some ‘fun runs’ he began to take running more seriously, and at age 64 achieved his fastest marathon time of 2:52:32. He trained with tigerish ferocity, typically doing sessions such as 20x400m. He set his sights on being the first 70 year old to break 3 hours, and with typical determination he raced 20 marathons that year, without achieving his goal. He subsequently accepted ironically that his determination exceeded his sense. He did break Warren Utes’s half-marathon world record with a time of 1:25:36, and the following year he broke Utes’s M70-74 marathon record with a time 3:00:58. Then at age 73 he suffered the first of three serious accidents that might have persuaded a less determined man to give up. First, he broke his hip in a bike accident. Then, sixteen months later he broke his left leg when he slipped and fell in icy snow, and a further ten months later, he stubbed his toe on a rock while running seriously injuring his foot and tearing tendons. He resumed running, but perhaps fortunately, guided by his son’s advice he decreased the intensity of training. Similarly to Eric Ӧstbye and Ed Whitlock, he subsequently trained mostly at low intensity for several hours per day, though at an even lower intensity with about half of the distance covered walking in woodland. He loved the outdoors; the sun, the wind and the rain. Typically, he ran for about two hours every third day, and walked for a similar time on each of the intervening two days. His race times slowed but nonetheless at age 76 he set US national records at 5K and 10K, and he ran a 1500m in 5:47. The following year his marathon time of 3: 19:01 was only about a minute outside Warren Ute’s M75-80 world record, and 5 years later at age 82 his marathon time was 6th in the all-time rankings for the M80-85 category at that time. Derek Turnbull was a New Zealand sheep farmer who dominated the world of veteran distance running from 1977 to 1992. He had been an enthusiastic runner since his teen-age. Despite subsequently down-playing the athletic achievements of his younger days, he had run a half mile in little over 2 minutes, a mile in 4:23, and achieved fourth places in New Zealand three- and six-miles national championships on several occasions. At university, he was awarded an athletics Blue. The tradition of awarding Blues to mark sporting achievement had originated in Oxford and Cambridge, and had been taken up, perhaps with slight tongue-in-cheek enthusiasm, in some antipodean universities. I am wryly amused by the fact that the only surviving tangible memento of my own early athletic achievements is the venerable document recording the Blue awarded to me by Flinders University. My mother had it framed and I have never had the heart to throw it away. But even if in retrospect, a Blue might be seen as a peculiar mark of respect for the venerable universities of the ‘mother country’, it provides me with a tenuous link to Turnbull, while also illustrating that his athletic gifts were recognised when he was a young man. However, the thing that makes him a world-class athlete was the fact that nearly four decades later at age 60 he broke the M60-65 world marathon record with a time of 2:38:47, in my home town, Adelaide. Five years later, in 1992, he established a M65-70 world marathon record with a time 2:41:57 in London. That record still stands, and is the prize that Yoshihisa Hosaka is aiming to take in Toronto in November this year In the intervening years,Turnbull ran an 800m in 2:14.53, a 1500m in 4:28.00 at age 62. He continued to run after suffering a stroke in 2001 but sadly died in 2006 at age 79. Like his countryman, Jack Foster, Turnbull did not follow any specified training plan, but ran across the fields and through the forests on his property, Sherwood farm, as the whim took him. Nonetheless, his whims often dictated a fast pace, and it is probable that his training included a good mixture of easy and fast running. In an obituary published in Running Times in February 2007, Roger Robinson stated that ‘a visit to Sherwood Farm revealed that running how Derek felt in fact produced a perfectly balanced program of long runs, tempo, and fast work’. In his youth, Luciano Acquarone focussed on middle distance events, enjoying success at regional level in his native Italy. In his early forties he turned his attention to the marathon, achieving a time of 2:20:21 at age 42, while also continuing to perform well at 5,000m and 10,000m. In his late forties he suffered tendonitis requiring surgery, but then his career blossomed on the world stage in his early 50’s. He set a world 50-55 age group record of 30:05 for the 10000m record in 1981. That year he ran a marathon in 2:28:28, placing him 5th on the world ‘all-time’ list of 50-55 year old marathoners. He continued to flourish, setting a M60-65 world marathon record of 2:38:15 at Turku in 1991, in addition to capturing the M60-65 10,000m world record. Over the subsequent 15 years he continued to post times in the marathon and also at shorter distances that placed him high in the world rankings. Again at age 75 he achieved another age group world marathon record with a time of 3:10:57. At 81 he set a European half marathon record and the following years a M80-85 world record at 3000m. Thus Acquarone has performed at elite level as a veteran over a period of 40 years, and has set world records spanning distances from 3000m to marathon, spread over a three decades. It is ironic that, apparently on the basis of a superficial examination of the data, Ross Tucker selected Acquarone to illustrate his proposition that most elite veterans appear at the top of the world ranking for only a brief few years, in support of Tim Noakes’ hypothesis that training and racing at elite level damages the legs. We will return to address that interesting hypothesis subsequently. I discussed Ed Whitlock and his training in detail my post of August 2nd. Here I will summarise only those features that are especially relevant to the topic of this post and the next. As a school boy he showed promise of athletic talent, running a mile in 4:31 and notably beating the future world champion distance runner, Gordon Pirie in a cross country race. Unfortunately, an Achilles tendon injury at university contributed to his decision to stop running, and lack of opportunity for racing after he moved to Canada to take up a job as a mining engineer consolidated that decision. He began running again in his forties, focussing mainly track racing with a strong determination to win. His training placed a strong emphasis on demanding interval sessions. At age 48 he ran his best marathon in 2:31:23 after a winter of solid high-volume training and later that year won gold in the 1500m at the M45-49 masters world championships in Hannover with a time of 4:09. But his greatest achievements as a marathoner came after he shifted to a training program in which the key feature was daily long runs at a very easy pace, spiced up with occasional fartlek-style speed work and frequent races. In the four years from his impressive time of 2:52:02: in the Columbus Ohio marathon, in 1999 at age 68 to his awe-inspiring 2:54:49 at age 73 in the Toronto Waterfront marathon in 2004, he gradually increased the frequency of 3 hour runs. In the 20 weeks prior to the 2004 Waterfront he did 67 three hour runs, including 18 on consecutive days. Contrary to the almost inevitable year on year decline observed even among elite elderly marathoners, he actually ran faster at 73 than during the Waterfront Marathon the previous year when he became the first man to run a marathon under 3 hours with a time of 2:59:10. It is also noteworthy that his best 1500m time of 5:08,6 at age 73 was less than a second slower than his best at age 72, whereas an increase of about 5 seconds over a year would be expected. Thus, the increased amount of slow running did not harm his speed. He has continued to set world records distances ranging from 3000m to the marathon, including setting the M80-85 marathon world record with a time of 3:15:54 in 2011. I discussed the running career of Yoshihisa Hosaka in my post of August 18th and will only give a brief summary here. He was a champion runner at school but during his twenties he focussed on surfing, only returning to running at age 36. Initial success at shorter road races led him eventually to the marathon. He achieved a personal best of 2:25:28 at age 45 and after further refining his training program, set the M60-65 world record with a time of 2:36:30 at the Beppu-Oita Marathon in 2009. As he described in an interview with Brett Larner, his training at that time was based on 5x1Km twice daily at a gradually progressive pace within a total of 32 Km per day. In the following three years he continued to race well , capturing the M61 and M63 single-age world records, though his marathon time increased at a rate of over 3 minute per year compared with an expected slowing of about 2 minutes per year for an elite runner in his early 60’s. In last year’s Gold Coast marathon he narrowly failed to capture Clive Davies M64 single-age record of 2:42:44 and this year faces the major challenge of capturing Derek Turnbull’s M65-70 record of 2:41:57. What do these ancient marathoners share? First, with the exception of John Keston, all showed evidence of at least a moderate athletic talent in young adult life, but none were of international class at that stage. Gilmour represented his state in national championships in his twenties, within a year of his return for prisoner of war camp; Ӧstbye began to dominate Swedish road racing in his thirties; Turnbull won an athletic Blue at university; Acqualone was a successful middle distance runner at regional level in his twenties; Whitlock famously beat Gordon Pirie in a cross country race as a school boy; and Hosaka was a school-boy champion. Although Keston did not start running until age 55, his immediate success in fun runs made it apparent that he too was gifted. However the thing that made all seven of these runners great were their performances in their 50’s, 60s, and 70’s and in several instances, in their 80’s. Their great performances were not confined to the marathon. With the exception of Eric Ӧstbye who rarely ran on the track, all of them have been listed in world masters rankings for 1500m, and several of them set national or world records at 10,000m. Thus, even more important than their talent for distance running as young men, was the fact that their performances declined with age at a much slower rate than the average person. This reduced rate of decline applied across the spectrum from 1500m to marathon. Nonetheless, despite a reduced rate of decline from young adult life to middle age, they did all decline. Data from the Master Athletics track and field world rankings indicates that this rate became fairly uniform by the middle years of the seventh decade. At that stage, the rate of their slowing was around 1.5% per year for both marathon and 1500m. The degree of commonality in these features across all seven athletes suggests at first sight that the type of training did not play a crucial role. All undoubtedly trained consistently and with determination, but the content of their training sessions differed substantially. Ӧstbye, Whitlock and Keston (in his later years) did a high volume of easy running with a small amount of faster training and/or racing over short distances. Turnbull was deliberately more spontaneous in his training but appears to have included a reasonably balanced mixture of training paces. As far as I can gather from the information available to me, Gilmour and Acqualone also included a balanced a mixture of paces. The central feature of Hosaka’s training is 5x1Km intervals twice daily at a gradually progressive pace, within an overall total of 32 Km per day. Presented in such broad brush strokes as this it is difficult to reach any conclusion about training other than that a variety of different training programs can lead to success, provided the athlete has a degree of natural talent for running together with a predisposition to age slowly, and the training is consistent. However, I think that a finer grained analysis does allow us to draw some speculative but potentially useful conclusions about how to train, whatever the level of one’s natural talent. There is a related question that arises from the hypothesis that an athlete can only expect to remain at his/her peak (relative to the WAVA age norms) for a limited number of years on account of the damaging effect of the training and racing required to attain one’s peak. These seven ancient marathoners were selected for this discussion on account of their longevity in the world marathon rankings, and hence do not provide an unbiased sample in which to test that hypothesis. Nonetheless, because they tend to be exceptions to the rule, they do offer interesting insights into the limits to the validity of the hypothesis. Furthermore, a finer grained analysis of features of the training of some of these seven marathoners does provide some clues regarding the way one might train to remain near to one’s peak for longer. In my next post, I will examine a few of the finer details of the training of these seven athletes that proved pointers toward how to achieve one’s best in middle-age, and how to sustain that peak relative to WAVA age norms into old-age. At high school Yoshihisa Hosaka was a champion track athlete. After several years devoted to surfing, he began running again in his mid-thirties, focussing on short road races, but did not seriously contemplate the marathon. At age 42 he won a 7 Km race that earned him a trip to compete in the Honolulu marathon. He completed it in 2:31:19. In an interview with Brett Larner, editor of Japan Running News, in 2009, he described the way in which he developed his training over the next few years, achieving a marathon personal best time of 2:25:28 at age 45, an impressive performance but appreciably slower than the time of 2:20:28 achieved by Jack Foster at age 50, and well outside the world M45+ record of 2:14:16 set by Jackson Kipngok Yegon of Kenya. Hosaka continued to develop his training and settled on a consistent routine of two sessions daily, both including 5x1Km intervals within a daily total of 32Km. In February 2009 at age 60 he took nearly two minutes of the world M60+ record with a time of 2:36:30 at the Beppu-Oita Marathon. His best performance in the past 15 months was 2:46:14 at the Gold Coast Airport Marathon in July 2013 at age 64, though this was over three minutes outside Clive Davies’ single-age world record for a 64 year old of 2:42:44 set in 1979. At the Toronto Waterfront marathon last November Hosaka started well but his leg muscles tightened-up during the middle stages of the race and he finished in 2:50:44. At the Gold Coast marathon this year, he won the M65-69 age group in a time of 2:52:13. But he still has his eyes on breaking Derek Turnbull’s M65+ world record of 2:41:57 in Toronto in November. Hosaka’s peak performance deteriorated by 11 minutes in the 15 years from his personal best at age 45 to his world M60+ at age 60, and by almost 10 minutes in the 4 years from age 60 to his 2013 Gold Coast marathon at age 64. According to WAVA, the deterioration expected for a runner at the highest level would be 20 minutes from age 45 to 60, and 6 minutes 15 seconds from age 60 to 64. 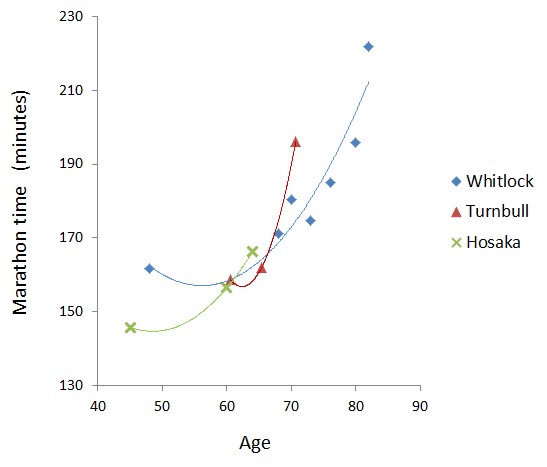 Thus, Hosaka deteriorated at only half of the rate predicted by WAVA between his PB at age 45 and his world record at 60 but he has deteriorated at almost 70% more than WAVA would predict from age 60 to his best performance within the past 15 months. One should not base too much on his recent races slower than 2:50 in Toronto in November 2013 and the Gold Coast in July 2014, as the marathon is an unpredictable event in which sub- peak performances are not usual, Nonetheless these two races do provide a further hint at the possibility of a more rapid deterioration in his mid-sixties. To what extent has his training contributed to his outstanding improvement relative to WAVA prediction in the period from 45 to 60, and might this training have actually led to a faster deterioration than that predicted by WAVA in the years since age 60? The unvarying daily schedule of two sessions, each of which would be only moderately demanding in isolation, allows him to monitor how well his body is coping with the training much more effectively than a program that alternates hard and easy days. In similar manner, Ed Whitlock, whom I discussed in my previous post, follows a consistent program of daily long runs, though Hosaka’s schedule provides greater variety within each day. While the human mind craves variety, the body adapts very well to a routine. I consider that the doctrine that the body needs fresh challenges in order to improve is over-rated. Consistency is of greater importance, though it is probable that the best results are obtained when demands of training increase gradually over a long period. Frequent racing also adds spice. There are two occasions in my own running career when I did daily doubles with very little variation over a period of many months. The first was as a youngster when I ran to and from school at a comfortable pace each day for several years. I did not find this irksome, and believe that it laid the foundation for what success I later enjoyed as a distance runner. Then in my early twenties, I ran 10 miles twice daily for several months, guided by a fragmentary knowledge of Lydiard’s recommendation of running at least 100 miles per week. I ran at what I assumed Lydiard meant by a ‘good aerobic pace’ though I ran many of those miles not far below the second ventilatory threshold, which was probably somewhat faster than Lydiard would have recommended. Again I did not find the routine irksome, though at the time I was working very long hours and eventually became increasingly tired. Nonetheless, in the following summer season I ran the best 5000m races of my career and also achieved a memorable victory in the only 10,000m I have ever raced. Although he is not finicky about his life-style, he eats a balanced diet and believes it’s important to let the body use its natural healing processes. He employs strength exercises and weightlifting to prevent and treat injuries. He trains in relaxing surroundings. Although his work as a businessman no doubt creates some pressure, as his own boss he has the opportunity to regulate his own stress level. I consider that Hosaka’s preparedness to identify a training program that suited him well and enabled him to train consistently were the key features that allowed him to make substantial improvement in marathon performance between age 42 and 45, and then to slow the rate of decline over the following 15 years. In his consistency and his care to avoid undue stress, Hosaka resembles Ed Whitlock. However, while both of them have included a small amount of fast running and frequent racing to maintain their speed, in other respects the content of their programmes is dramatically different. Hosaka focusses on gradually progressive 1 Km repetitions but no long runs, whereas daily 3 hour runs at a slow pace are the key feature of Ed’s programme. Both have been phenomenally successful over a period of a decade or more, confirming that there is no single way to train in order to achieve outstanding marathon performances. Does our understanding of body physiology provide any clues as to which approach is likely to offer the greater prospect of sustained elite performance over several decades? . Training produces benefit by creating a stress that provokes the body to react in a manner that enhances the ability to withstand stress in future. The mechanism of the stress response is only partly understood, but current understanding does provide useful guidance for planning training. The first general principle is that stress generates a two-phase response. The initial response is the catabolic phase in which the body’s priority is breaking down of tissues to supply fuel for energy production. Glycogen is broken down to release glucose and if the stress is sustained, protein is broken down into amino acids which in turn can be used as fuel. The catabolic hormones adrenaline and cortisol plays a cardinal role in regulating these metabolic processes. In addition, physical trauma, such as the eccentric muscle contraction at foot-strike, produces microscopic tearing of tissues. After cessation of exercise, the level of adrenaline falls within minutes while the level of cortisol returns to baseline over period of an hour or two. However, a second bout of exercise within 3 hours produces an even greater surge of adrenaline and cortisol, compared with a similar second bout of exercise after 6 hours. This indicates that even after cortisol has returned to baseline, signalling molecules circulating in the bloodstream are a marker of residual stress. This sustained marker of stress diminishes markedly by 6 hours. However other markers of stress such as a fall in blood levels of lymphocytes, which play a role in protecting against infection, can persist for 24 hours. The second phase is the anabolic phase during which tissues are repaired. Various different processes are involved. Anabolic hormones stimulate the re-synthesis of protein. A complex set of chemical messengers including various cytokines, trigger an inflammatory response. Capillaries become leaky allowing fluid containing scavenging white blood cells and materials required for repair, to reach damaged tissue. The scavenging white cells remove cellular debris, while the deposition of collagen fibres strengthens tissues. Satellite cells, which are a form of stem cell found in muscle, promote regeneration of muscle. If there is repeated stress before recovery is complete there is a risk of a third phase. Sustained elevation of cortisol can occur, causing continued suppression of the immune system and inhibiting anabolism. Paradoxically, sustained elevation of cortisol can promote chronic inflammation by blunting the body’s response to cortisol. Chronic inflammation leads to disorganized deposition of collagen fibres in body tissues, impeding the function of these tissues. .It is even possible for collagen deposition in the walls of coronary blood vessels to promote atheroma that might eventually increase the risk of heart attack. It is noteworthy that sustained moderate elevation of cortisol is not uncommon in distance runners, and is related to both volume and intensity of training. While there is little compelling evidence that even quite intense training produces harm that outweighs the benefits of vigorous training over a period of several years, I suspect that if one wishes to train at elite level over a period of decades, it is crucial to maintain a healthy balance between catabolism and anabolism, and to avoid the potentially harmful third phase. It is likely that training programmes that carefully avoid excessive stress, have enabled both Hosaka and Whitlock to remain at elite level for at least a decade, and in Whitlock’s case, for even longer. I see no reason to propose that Hosaka’s carefully calibrated interval sessions are more likely to produce sustained stress than Whitlock’s frequent 3 hour slow runs. However, there is one respect in which I think Whitlock’s approach is safer. Although his programme is not deliberately periodized, by virtue of various circumstances, including arthritis and accidents, he has been forced to cut back his training from time to time, and whenever he does so, he builds up the duration of his long runs very gradually. I suspect that gradual adaptation is a key feature of his success. Hosaka’s own comments reported in another interview with Brett Larner in Toronto in November 2013 suggest he is considering a change. He acknowledged that he was finding it harder to maintain his daily interval sessions, and perhaps might even change to Ed Whitlock’s high volume, low intensity approach, though maybe this was simply an expression of Japanese politeness while he was a guest in Ed’s home town. In 2013, Hosaka missed the single-age M64 world record, after capturing M59, 60, 61, 63 world records in the previous five years. It is interesting to speculate that he might be beginning to experience the accelerating deterioration that many runners experience in the mid to late sixties, but only time will tell. Whitlock had also shown slight hints of a stutter in performance for two or three years after his superb 2:52:50 in the 1999 Columbus Ohio marathon at age 69, but he came back with a tremendous improvement to achieve 2:54:48 in Toronto at age 73. Although Ed has slowed appreciably in the subsequent decade, nonetheless in his early eighties, he still breaks world records at distances from 1500m to marathon with remarkable regularity. Undoubtedly his training regimen has combined with his apparently inherited predisposition to longevity to delay the inevitable deterioration of performance with age, whereas the effectiveness of Hosaka’s regimen beyond the mid-sixties remains un-tested . So it will be very interesting to see how well Hosaka can hold his form over the next few years, and in particular, to see whether or not he moves to lower intensity long training runs. But whatever he does, the records that Ed set in his early 70’s are going to be very hard to beat. In recent months I have been re-building the base fitness required for another marathon. I would like to run a ‘good’ marathon, though after my somewhat disappointing performance in the Robin Hood half-marathon last September and apparent acceleration of age-related deterioration since then, it is difficult to estimate what would a reasonable target time. However my definition of a good marathon is based more on how I run it than on the time achieved. I want to be fit enough to maintain a pace near lactate threshold for the entire distance. While I anticipate that the final 10 Km will be demanding, I would nonetheless hope to have enough resilience in my legs to allow me to maintain reasonable fluency over that final 10Km. When I last trained seriously for a marathon, well over 40 years ago, the two most influential figures shaping opinions about how to train were Emil Zatopek, the giant who had dominated distance running from 1948 until 1954, and Arthur Lydiard, whose athletes had created a sensation at the Rome Olympics in 1960. In retrospect it is surprising how slowly ideas travelled though the running community. In the pre-internet era, we relied largely on word-of-mouth rumours. Lydiard’s first book, ‘Run to the Top’ had been in print since 1962, but the apparent conflict between Lydiard’s emphasis on running 100 miles per week, mostly at a ‘good aerobic pace’ and the fragmentary information about Zatopek’s punishing training regimen, fuelled continuing debate. Nonetheless, the 1960’s was a golden age for marathoning in which the world record tumbled from Abebe Bikila’s 2:15:16 in the Rome Olympics of 1960 to Derek Clayton’s 2:08:33 (over a disputed course) in Antwerp in 1969. My training was mainly shaped by Lydiard’s ideas. I ran a fairly large volume (though rarely 100 miles per week) at a good aerobic pace, including long runs in the hills, together with occasional interval sessions. In those days we were less concerned about actual finishing times because it was recognised that the time in a marathon was dependent on the course. I have no record of my best time. I was by no means elite. The only time I have been able to recover from internet archives was 2:33:07 recorded in the Australian Marathon championship in 1970 though at my best I ran quite a lot faster than that. But sadly, age has taken a serious toll. My capacity to recover from long runs at a good aerobic pace has deteriorated markedly. So how should I train now? In my recent post on the debates of the past decade, I concluded that the evidence is in favour of polarised training: a large volume of easy running spiced with a small volume of higher intensity training. However there are many variants that might be described as polarised. In this post and the next, I will compare pairs of great marathoners, past and present, who I believe provide some thought provoking illustrations of training principles. I will start with a comparison of Haile Gebrselassie and Jack Foster, both exponents of polarised training sharing some key features, but also differences. In my next post I will discuss two amazing veterans: Ed Whitlock, who practises an extreme form of polarised training, based on a very large volume of easy running together with a small volume of high intensity running provided by fairy frequent races over distances from 1500m to 10K; and Yoshihisa Hosaka, whose daily interval training is the antithesis of polarised training, apparently owing more to the example of Zatopek than Lydiard. Geb has a strong claim to stand beside Emil Zatopek in the pantheon of distance running legends. In the 16 years from the 1993 World Championships in Stuttgart, where he won gold in the 10,000m and silver in the 5000m to his marathon world record of 2:03:59 in the 2008 Berlin marathon, Geb was as dominant a figure as Zatopek had been over the 7 years from his gold medal in the 10,000m at the 1948 London Olympics to his gold in the 10,000m and silver in 5000m at the 1954 European Championships. Zatopek had reached his zenith with gold in the 5000m, 10,000m and marathon at Helsinki in 1952, just before his 30th birthday. He struggled into 6th place at the Melbourne Olympics four years later, admittedly shortly after surgery for a hernia. He retired from competition at age 35, having created a legend based on gruelling training that combined high volume with high intensity. In contrast, although Geb had achieved international prominence at a slightly younger age than Zatopek, he was 35 when he achieved his fastest marathon in Berlin in 2008, and is still competing in 2014. He has struggled to be competitive at the highest level since his failure to finish the New York marathon in 2010, but nonetheless achieved a creditable third behind Kenenesa Bekele and Mo Farah with a half-marathon time of 60:41 in the Great North Run last year, at age 40. Geb has been generous in providing information about his attitude to training and racing, but is understandably reticent about the details of his training. In a BBC question and answer session in 2002 he stated that his training schedule was secret. Nonetheless a sample week of his base training from 2006 was published on the Powerbar website and is still accessible on the Runzone website. As is typical of African runners, his training is polarised. Almost 60% (110 km of his 190km a week) was at 6:15 min/mile or slower. About 8 % was at paces near marathon pace, and 6% faster than marathon pace (approximately 4:48 /mile that year) As noted in the discussion on Runzone, he trained at Addis Ababa at an altitude above 8000 feet. Thus the training performed near to marathon pace would have been more demanding than marathon pace at sea level. The difference in effort between sea level and high altitude depends on how well the individual is acclimatised. The experienced coach, Tinman estimates that the effort at altitude 8000’ would be equivalent to that at a pace around 7% faster at sea level. According to this estimate, Geb’s easy pace of 6:15 per mile would probably be equivalent to around 5:50 per mile at sea level, which is a little over a minute per mile slower than his pace in the Berlin marathon that year. Whatever plausible estimate of the altitude effect one makes, it is clear that Geb was doing a substantial proportion of his training at pace which would have been fairly easy for him. Elsewhere Geb makes it clear that he was careful to avoid too much stress. In his BBC Q&A session in 2002 he states: ‘I generally have 13 training sessions a week. On Sunday I only run once. Each week, I try to do 3 speed sessions, one long run (1½/2 hours) and one or two Fartlek sessions. The rest of the sessions are endurance runs that I try not to run too fast. They help my muscles to recover from the hard training’. Thus 8 of his 13 sessions are not too fast in order to facilitate recovery. He takes delight in running in the forest. He considers that one of the best pieces of advice about running he ever received was from his agent Jos Hermens. He states: ‘Jos taught me not to run too many races and to train and rest well. When I started to do this, my performances got even better’. Though one cannot draw general conclusions from the experiences of two individuals, it is noteworthy that Geb remained at the top of the field for over twice as long as Emil Zatopek. In an interview with Adharanand Finn, of the Guardian newspaper in 2013, Finn asked how he had managed to keep going for so long. Geb replied: ‘You know, there is no secret. I am just always very careful when I’m training. All athletes need three things: commitment, discipline and hard work’. The reference to being very careful suggests that the required discipline is the discipline to balance the hard work with recovery. At age 41, Geb is still eager to set records the Masters age group. His sub 61 minute half marathon in the GNR in September 2013 suggests that the M40-44 marathon world record of 2:08:46 is still within his reach. But the marathon is a far greater challenge than the half, and Geb has not completed a marathon since February 2012, when he was placed 4th in Tokyo with a time of 2:08:17. He had been aiming for the M40-44world record in the Hamburg marathon in May of this year, but withdrew due to concern about possible breathing difficulties arising from high pollen levels. It remains to be seen whether or not he can achieve the Masters record. Meanwhile it is worth examining the training and achievements of a remarkable athlete who laid down a challenge the limitation of age, 40 years ago. As a young man Jack discovered the joys of cycling over the moorland of northern England and the hills of nearby Wales as an escape from the dreariness of his factory job in post-war Liverpool. The opportunity to escape to even wider open spaces came in the form of £10 assisted passage to New Zealand when he was 24. He returned to Britain to marry, and five year later, once again emigrated to New Zealand. At age 32 with a young family to support and faced with the anticipated expenses of competitive cycling, he decided to run. On his first run he was breathless within minutes, but nonetheless took to running with enthusiasm and impish delight. Much of the story of the following decade is told in his short 48 page book, ‘The Tale of the Ancient Marathoner’ (World Publications, 1974). He claimed not to train, by which he meant that he rejected prescribed training schedules, and ran as he felt inclined. His favourite runs were cross country for an hour or two over the sheep pastures of the Rotorua district of New Zealand’s north island. However he was no stranger to pushing himself hard, and reports that during races he ‘ran his tripes out’. In 1971, at age 39, he established a world record at 20 miles on the track. In his diary he wrote: ‘80 bloody laps, must be stupid! ….world best for 20; not bad for an old bugger’. He represented New Zealand in the Olympic marathon in Munich in 1972, and again in the Montreal Games four years later. But his most striking performance was his run in the marathon in the Christchurch Commonwealth Games in 1974. Though by this stage a 41 year old, he took the silver medal with a time of 2:11:18.6, a little over two minutes behind the winner, Ian Thompson, whose time of 2:09:12 was the second fastest ever recorded, less than a minute slower than Derek Clayton’s disputed record set in Antwerp in 1969. Thus, at age 41, Foster was among the world leaders at the end of that golden decade of marathoning that followed Bikila’s barefoot run in Rome in 1960. . In an appendix of ‘The Tale of the Ancient Marathoner’ Foster gives a verbatim account from his diary of his running in the four weeks prior to his 20 mile world record in August 1971. He did 28 training sessions, though he was reluctant to call them training. Eighteen of the runs were easy, mostly described as jogging across country. He ran three hard hilly runs, and did four interval sessions (4×1 miles on a horse race track). He ran a 2-mile time trial, a cross country County Championship race and a 20 mile road run in 2:03. He ran doubles on three occasions, but did not run on three days: once because he felt too tired, once after being delayed getting home from work due to a car break-down, and once due to a stomach upset. He covered about 70 miles per week. Overall, the balance of hard and easy sessions is similar to the Haile’s training in the period 2003 to 2006, though the total volume was appreciably less, and there is a somewhat greater sense of spontaneity in Jack’s choice of sessions. A glimpse of his spontaneity is provided in the latter part of the inspiring film ‘On the Run’ released by the New Zealand Film Unit in 1979. As an aside, although that short film was released almost a decade after my own heyday as a runner, and the landscapes of New Zealand are grander than the gum-tree covered slopes and gullies of the Adelaide hills in which I ran, it evokes so vividly the era in which I fell in love with running. On the one hand there was the precise organization but undeniably amateur atmosphere of track events run under the auspices of the Amateur Athletic Association; on the other hand, the freedom of running across farmland and hill country. Perhaps a crucial snippet was Arthur Lydiard’s slightly breathless remark to 3000m runner, Heather Thompson, as they ran together though the scrub: ‘just slow down Heather, the distance is more important than the speed. You have just got to keep it at a pleasant effort’. Although at the time we had debated the merits of Arthur’s ideas, in retrospect, it is clear that those ideas played a key part in shaping that golden era. After the Montreal Olympics Jack continued to run and race. His achievements included a M50-54 world marathon record of 2:20:28 in Auckland in 1982. He was disappointed not to be the first 50 year old to break 2:20. The current M50-54 world record is 2:19:29. In later years Jack returned to cycling, though he did a small amount of running. In a letter written to James Doran in January 2004 at age 72, he mentioned that he was no longer running but was cycling, “200-300km most weeks” Poignantly, he added that cycling was “much more fun than running, and no injuries, unless one crashes!” Sadly he was knocked from his bicycle and killed when out cycling on the roads of Rotorua five months later. Foster’s M40-44 record set in Christchurch remained unbroken for 16 years and even now, his time of 2:11:18.6 remains the fastest ever marathon by a 41 year old. Whether or not Haile Gebrselassie manages to eclipse this time before his 42nd birthday next April, Foster’s achievement 40 years ago is truly remarkable. The debate between high intensity and high volume training has been a perennial topic since the early days of scientifically-grounded training. Interval training was developed in the 1930’s by the German coach and academic, Woldemar Gerschler. He based his recommendations on the theory that the heart muscle would be strengthened by the increase in cardiac stroke volume that occurs as heart rate drops immediately following an intense effort. A decade later, Gerschler’s compatriot, sports physician Ernst van Aaken proposed that the crucial requirement was delivering copious amounts of oxygen to the heart, and this could best be achieved by running long distances at relatively slow paces. It is noteworthy that a large volume of slow running also increases delivery of oxygen to the leg muscles. Van Aaken’s approach was later developed by New Zealander, Arthur Lydiard, based largely on trial-and-error adjustments of his own training. Lydiard’s method led to medals for his athletes, Peter Snell, Murray Halberg and Barry Magee in distances from 800m to the marathon at the Rome Olympics in 1960. While Lydiard promoted a high volume approach to building basic aerobic fitness, his program also included periodization – a progression from base building to a period of race specific training and final sharpening immediately prior to competition. Meanwhile, interval training retained its devotees and underpinned the golden age of British middle distance running that reached its pinnacle with Seb Coe’s Olympic gold medals in the 1500m in 1980 and 1984. By the end of the century, Japanese academic, Izumi Tabata had demonstrated that repeated very intense brief maximal efforts lasting only 20 seconds separated by even briefer recovery periods, produced impressive increases in aerobic capacity (reflected in increases in VO2max) while also enhancing anaerobic capability. Meanwhile, devotees of high volume, less intense training, led by charismatic individuals such as John Hadd and Phil Maffetone, emphasized the risk that focussing on high intensity training might undermine sound long term development. So what has the past decade contributed to this long-standing debate? The fundamental principle of training is that training produces stress on the various physiological systems within the body, such as the cardiovascular system, skeletal muscles and the nervous system, and subsequent adaptive change as the body responds to that stress leads to increased fitness. The past decade has seen an explosion of knowledge about the multitude of biochemical signalling processes that trigger these adaptive changes. In addition to the hormones produced by the major endocrine glands, there are a vast number of other relevant signalling molecules, including the numerous cytokines that regulate inflammation (the cardinal process that mobilises repair in tissues throughout the body) and growth factors that promote changes in many tissues. In particular, growth factors and hormones promote the activation of satellite cells in muscle. These satellite cells are a type of stem cell that fuse with muscle cells to repair and strengthen them. While this explosion of knowledge does provide useful clues regarding the way the body might react to various forms of training, at present the complexity of the information precludes any simple answer to the high volume v high intensity debate. It does however provide support to both sides, indicating that the best answer will prove to be a combination of the two. The most striking feature of elite distance running in the past decade has been the dominance of African runners, mainly from the highlands of Kenya and Ethiopia. There have been many anecdotal accounts that make it clear that high volume training, with several training sessions per day, is an important aspect of the training program of virtually all elite Africans. Usually the day’s program includes one session of quite low intensity running, but many accounts also describe other sessions of quite intense running – especially sustained tempo efforts. I will not attempt to review all this information here, in part because of its diversity but even more importantly, it remains unclear just how much cultural factors (such as running to school in childhood); multiple genetic factors; and up-bringing at high altitude have contributed to the African dominance. It remains to be demonstrated convincingly that the training methods employed in Africa can adapted to produce similarly impressive performances by non-Africans. I will nonetheless draw attention specifically to the training methods adopted by Renato Canova, coach to many of the leading African half-marathoners and marathoners. I have described Canova’s training previously. In his lectures and writing, Canova places little emphasis on low intensity running, perhaps because the athletes he trains have already achieved extensive development of capillaries and other aspects of type 1 fibre development. Nonetheless, the training dairies of the athletes he coaches reveal that in addition to the relatively intense sessions there is a large amount of low intensity running. For example about 80% of the training of Moses Mosop is at an easy pace, with occasional sessions as slow as 5 min/Km (which should be compared with his marathon pace of around 3 min/Km). Canova advocates a periodized approach. The crucial feature of the race specific phase is long runs at near race pace. As mentioned above, some of the studies comparing high intensity interval training with standard endurance training, such as the study by Bangsbo and colleagues, demonstrate greater improvement in performances over distances from 3Km to 10Km with the high intensity training, while others, such as those by Gibala and colleagues report similar gains in performance with high intensity training and conventional endurance training, although the high intensity programs achieved similar benefit from a much smaller volume of training. However, those studies were performed over a time scale of approximately 8 weeks. This is scarcely long enough to exclude the possibility that high intensity training might result in a harmful accumulation of stress. The question of longer term effects was tested in a study by Esteve-Laneo and colleagues from Spain. They randomly allocated 12 sub-elite distance runners to one of two training programs: a polarised program involving a large amount of low intensity training and small volume of moderate and high intensity training; and a threshold program involving a predominance of training near lactate threshold and a small amount of higher intensity training, for a period of five months. Training was classified in three zones: low intensity below the first ventilatory threshold (VT1) corresponding to the point where lactate rises to around 2 mM/litre; moderate intensity between VT1 and the second ventilatory threshold (VT2) corresponding to the point where lactate exceeds 4 mM/litre; and high intensity, above VT2 during which lactate accumulates rapidly. In the polarised program the proportions of low-, moderate- and high-intensity training were 82%, 10% and 8% while the proportions in the threshold program were 67%, 25% and 8%. At the end of the program, the group allocated to polarised training achieved significantly better performances in a 10.4Km cross country race. More recently, Stoggl and Sterlich from Austria performed a study comparing a 9 week polarised training program with three other programs: high intensity; high volume (low intensity) and predominantly tempo training, in a sample of national class endurance runners, triathletes, cyclists, and nordic skiiers. The polarized training group exhibited the greatest improvement in VO2 max (+ 11.7%) and time to exhaustion (+17.4%). The high intensity group achieved a 4.8% increase in VO2 max and an 8.8% time to exhaustion 8.8 percent. The high intensity group lost 3.8% of body weight, which Stoggl and Sterlich attributed to a harmful catabolic state. Improvements were small and insignificant for the other two training programs. It should be noted that these athletes were a national standard and had probably achieved the improvement that might be expected from either a high volume of low intensity training or from a predominance of tempo training. Neal and colleagues used a cross-over study design in which a group of well-trained cyclists underwent polarised training and threshold training, each for 6 weeks in randomised order. Similar baseline fitness was established by a 4 week de-training period before each training period. The proportion of training time in low-, moderate and high intensity zones was 80%, 0%, 20% in the polarised program, and 57%, 43% and 0% in the threshold program.The polarised training produced greater increases in peak power output, lactate threshold and high-intensity exercise capacity (time to exhaustion at 95% maximum work rate). Stephen Seiler, a Texan sports scientist based in Norway for the past decade, presented a summary of the evidence from the controlled comparisons of different training programs and also from studies that have examined the proportions of training time that elite athletes spend in different intensity zones, at a lecture delivered in Paris in October 2013. He provided a compelling argument for polarised training. However, despite the evidence that many elites follow a polarised program, the role of key sessions at a pace near to race pace in the training recommended by Renato Canova indicates that at least a modest proportion of threshold training is beneficial for marathoners. Furthermore, Canova recommends a moderate degree of periodization with a clearly defined period of specific preparation for key races. Overall, it is likely that any sensible training program will produce benefit for an unfit athlete provided it is consistent. However for an athlete who has achieved a plateau of fitness, it is probable that a polarised program with proportions of low-, moderate- and high-intensity of approximately 80%, 10%, 10% is most effective. Nonetheless, during a period of preparation for a specific race the key sessions should incorporate running at a pace near to race pace. The past decade has seen a continued growth of distance running as a mass participation sport. The major city marathons continue to attract many thousands of entrants with aspirations ranging from sub 2:30 to simply completing the distance in whatever time it takes. Perhaps more dramatically, parkrun has grown from a local weekly gathering of a few club runners in south-west London to an event that attracts many tens of thousands of individuals at hundreds of local parks, not only in the UK but world-wide, on Saturday mornings to run 5Km in times ranging from 15 min to 45 min before getting on with their usual weekend activities. Over this same period, the ubiquity of internet communication has allowed the exchange of ideas about running in a manner unimaginable in the days when distance running was a minority sport pursued by small numbers of wiry, tough-minded individuals whose main access to training lore was word- of-mouth communication. Not surprisingly, within this hugely expanded and diverse but inter-connected community there have been lively debates about many aspects of running, with diverse gurus proposing answers to the challenges of avoiding injury and getting fit enough to achieve one’s goals. Pendulums have swung wildly between extremes. My impression is that the fire in most of the debates has lost much of its heat as the claims of gurus have been scrutinised in the light of evidence. However, definitive answers have remained elusive. What have we learned that us useful from this turbulent ten years? 1) Does running style matter and if so, is there a style that minimises risk of injury while maximising efficiency? 2) Are minimalist running shoes preferable to the heavily engineered shoes promoted by the major companies? 3) What is the optimal balance between high volume and high intensity training in producing fitness for distance running? 4) Is a paleo-diet preferable to a high carbohydrate diet? 5) Does a large amount of distance running actually damage health, and in particular, does it increase the risk of heart disease. In all five topics, debate still simmers. I have scrutinised the scientific evidence related to all five of these question in my blog over the past seven years, and I hope I will still be examining interesting fresh evidence for many years to come. However whatever answers might emerge from future science, in our quest to determine the answers that will help us reach out running goals we are each an experiment of one and now is the point in time when we must act. I think that the evidence that has emerged in the past decade has allowed me to make better-informed choices in all five of these areas of debate than would have been possible ten years ago. In my next few posts, I will summarise what I consider to be the clear conclusions for the past decade of debate, what issue remain uncertain, and what decisions I have made with regard to my own training and racing. For me personally, the greatest challenge as I approach my eighth decade is minimising the rate of inexorable deterioration of muscle power, cardiac output and neuro-muscular coordination that age brings. Therefore my approach to these debates is coloured by the added complications of aging. Nonetheless, my goal is not only to continue to run for as many years as possible, but also to perform at the highest level my aging body will allow during these years. I hope that the conclusions I have reached will be of interest to any runner aiming in to achieve their best possible performance, whatever their age. While planning the next few months of base-building for a marathon in the autumn, I have been pondering the question of what are the most important foundations for marathon running. The marathon is run in the upper reaches of the aerobic zone, so at first sight, the most important goal of training is extending the duration for which one can maintain a pace in the vicinity of lactate threshold. This requires a good capacity for metabolizing lactate, so developing that capacity will be part of my base-building. Perhaps the most infamous feature of the marathon, at least in the mind of many recreational runners is the ‘wall’ that awaits somewhere near the 20 mile mark. It is often assumed that this wall reflects the point at which glycogen stores are exhausted, and all available glucose is shunted away from muscle to the brain. For the ill-prepared runner, that might well be a major issue, but dealing with the risk of serious glucose depletion should be relatively straightforward. A large volume of low to mid-aerobic running and sensible nutrition in the preceding months should ensure that a good proportion of the fuel at marathon pace is derived from fat, thereby conserving glycogen, which together with adequate ingestion of carbohydrates during the race itself, should minimise the risk of a shortage of glucose. While it is true that for many marathoners the gruelling memories are centred on the final few miles, in my own memories of the times when I have run a marathon with inadequate preparation, the point at which I became aware that I was not running well occurred shortly after half-way. At that stage, the problem wasn’t breathlessness, or agony. It was a loss of fluency in my stride. I was therefore intrigued by Reid Coolsaet’s account of his tribulations in Fukuoka in December. Reid’s blog provides the best personal account of elite marathoning available on the web. Reid had arrived in Fukuoka better prepared than ever and was aiming for sub 2:10; a PB and a Canadian national record. He started in the leading pack behind the pacemakers, Collis Birmingham and Ben St. Lawrence from Australia, running 3 min Kms (2:07 pace). When the lead pack split on an upward slope just before 16Km Reid sensibly opted to stay back with the second group, which included one of the current leading Japanese marathoners, Arata Fujiwara, who has a PB of 2:07. However Fujiwara was having a bad day and the second group slowed too much so Reid left them at 18Km and ran on alone. He was still comfortable maintaining his target pace when he reached half-way in 1:04:11. He then lost a few seconds as a consequence of grabbing the wrong bottle at the 25.8Km water station. He covered the 5Km from 30 to 35 Km in 15:51 but was not too worried at that stage. He reports that after 35km the going got really tough and he began to ‘lose it mentally’. He eventually finished in 6th place in a very creditable 2:11:24, just over 5 minutes behind the winner, Martin Mathathi of Kenya. Reid had again demonstrated that he is not very far behind the best of the current North American marathoners, despite lacking the resources of Nike’s Oregon Project. In his own analysis, the problem was running solo from 18Km to the end. That was almost certainly part of the problem. However, despite the seconds lost as a result of the confusion with the wrong bottle at 25.8Km, I think that the crucial evidence that the wheels were coming off was the 15:51 split from 30 to 35 Km. I suspect that the damage had been done in the first 15 Km, which he had covered about 1 minute too quickly. But what was the damage he had done? I doubt that the burning a little more glucose in the first 15 Km nor the confusion with his re-fuelling had left him in a glycogen depleted state by 30Km. I think perhaps a clue is to be found in the recently published study of marathon runners by Juan Del Coso and colleagues from Madrid. Del Coso performed a variety of physiological measurements on a group of 40 amateur runners immediately before and after the 2012 Madrid Marathon. The investigators retrospectively divided the runner into two groups according to how well they maintained pace during the race. The group of 22 runners who exhibited a decrease in pace of less than 15% from the first 5Km to the end were classified as having maintained their speed, while the group of 18 runners who slowed by more than 15% between the first 5Km and the end were classified as having a pronounced decrease in speed. The decreased speed group slowed their pace by an average of 29% while the group classified as having maintained speed exhibited an average decrease of 5%. The most interesting feature of the 5Km split times over the course of the race was the fact that the group with a pronounced pace decrease began to slow-down markedly shortly after half way. The difference in pace between the two groups became statistical significant for the split from 20 to 25 Km. But even more interestingly, the most significant difference in the physiological measurements was a much greater increase in the blood levels of the muscle proteins, myoglobin and lactate dehydrogenase, between the start and finish in the group who slowed. These proteins are markers of muscle damage. Both group exhibited a decrease in counter move jump (CMJ) height from before to after the event, but this decrease was greater in the group who slowed substantially. The group who maintained their speed exhibited a 23% decrease in CMJ height, while the group with pronounced slowing suffered a 30% decrease. Both groups of runners exhibited a decrease in weight of approximately 3%, assumed due to dehydration. There was no evidence of decrease in blood glucose in either group. The runners had been allowed to take fluids and carbohydrates according to their own inclination during the race. There was no appreciable group difference in body temperature. Thus, there was no evidence that dehydration, decrease in blood glucose, or hyperthermia, accounted for the different degree of slowing of the groups. It is also noteworthy that there had been no significant difference in prior training volume between the groups. In fact the group who showed the most pronounced slowing has actually performed a slightly larger volume of training. Thus the findings from this study suggest that for reasonably well- trained amateur runners who are allowed to re-hydrate and re-fuel according to their own inclination during the race, the major feature that is associated with deteriorating pace is muscle damage. Furthermore the deterioration becomes manifest shortly after the half-way point. The observation of appreciable loss of strength and power, together with increased levels of muscle proteins in blood indicating skeletal muscle damage during endurance events, has been reported previously. For example, the year previously Del Coso and colleagues had studied 25 triathletes participating in a half-ironman event. They found that after the event, the capacity of leg muscles to produce force was markedly diminished while arm muscle force output remained unaffected. Leg muscle fatigue was correlated with increases in blood levels of the muscle proteins, myoglobin and creatinine kinase, suggesting that muscle breakdown is one of the most relevant sources of muscle fatigue during a half-ironman. Looking back to my own experience in the half marathon in September, I was aware of aching legs though much of the race. Indeed I had been experiencing pronounced aching of the legs following most of my long runs during the preceding months. In my recent post I had discussed the possible role of elevated cortisol in my mediocre half marathon performance. While a link between cortisol and muscle damage is speculative, it is perhaps plausible that sustained elevation of cortisol had left me in a catabolic state with reduced capacity to repair muscle damage following long runs, for a period of several months. What are the implications for base-building this year? The first implication is that I should build up the length of long runs cautiously to minimise the risk of developing a catabolic state. I am even considering adopting Geoff Galloway’ s run/walk approach to see if I can build-up to a weekly training volume of 50 miles or more without persistent aching of my legs. A far as I can see there has been little good independent scientific investigation of the run-walk strategy though I think there are reasons to think that it might be a sound approach – and not just for elderly runners such as myself. I will discuss this in a future post. An alternative approach is to include more sprint training. In a study of the muscle damage produced by drop-jumping (which is often regarded a good model f the eccentric stress produced by running, Skurvydas and colleagues compared sprinters with long-distance runners and a group of untrained controls. Following 100 maximal effort drop-jumps, the sprinters experienced a smaller reduction in counter-movement jump height than the other two groups, while there was no appreciable difference in evidence of damage suffered by the distance runners and the untrained controls. It appears that sprint training might protect against muscle damage much more effectively that long-distance training. This year has been frustrating in an undramatic but challenging way. Undramatic because I have remained free of overt injury apart from some persistent though relatively mild problems with my joints and ligaments, but challenging because it has not been easy to identify why my fitness improved so slowly and then degenerated so rapidly. I achieved a greater volume of training – approximately 2000 miles (including the mileage equivalent of my elliptical cross-training sessions estimated on the basis of 100Kcal = 1 mile) than in any year in the past four decades. Taking account of my slower training paces, it is probable that I have actually spent more time training this year than during any year in my entire life. Yet through the summer I was frustrated by the tardy rate of improvement in fitness. There were few occasions when I experienced the exhilaration of running fluently and powerfully. I felt tired much of the time and experienced persistent aching of the connective tissues in my legs. My short term goal was a half marathon time faster than 101:50. Despite the fact that I was unable maintain a pace of 5 min /Km (corresponding to 105:30 for the HM) for even a few Km as the date of the event approached, I nurtured the hope that a three week taper with some drills and faster running to sharpen my pace, would allow me to defy any rational prediction based the evidence of my limited fitness. However, in the event, rational prediction was indeed confirmed and despite a spirited finish, I recorded a time of 107:45. In the aftermath I took some consolation from the fact that I had coped with a large volume of training without injury, though I was aware that I would need a few easy months to allow my body to recover. I cut my training volume to an average of slightly less than 30 (equivalent) miles per week, including an increased proportion of elliptical cross-training. After a month or so, I added a modest plyometric program as described in my previous post. The encouraging outcome was a modest improvement in hopping and jumping, indicating some gain in musculo-tendonous resilience and eccentric strength, but the dominating feature of the final few months of the year has been a devastating loss of fitness. Although I had cut my training volume substantially, the cut was less ruthless than the cut forced upon me by an episode of arthritis a year ago, yet the loss of fitness has been far greater. I am now at my lowest ebb since summer 2011 when a hectic and exhausting six months at work had left me with neither the time nor energy for solid training. In 2011, my lack of fitness illustrated the fact that for the elderly, fitness is hard won and easily lost. But in 2013, I am facing the disconcerting question: has fitness become even more difficult to gain and easier to lose as I have moved from my mid to late 60’s, or did I do something wrong this year? I had used submaximal tests throughout the summer to ensure that I was just one step short of over-training, as indicated by autonomic measures of stress, such as heart rate at submaximal effort and resting heart rate variability. However, perhaps I should have taken more notice of the chronic tiredness and aching legs. I suspect that my mediocre half marathon performance demonstrated that I was not merely over-reaching but that a least a mild degree of over-training had interfered with my ability to benefit from training. This lurking suspicion has been strongly re-enforced by the devastating loss of fitness since September. It is clear that I had not built a sound base. In the past few months, I have continually questioned whether or not I simply needed a bit more rest, but on the occasions when I have cut back the training volume even more drastically for a few weeks, the deterioration in fitness has accelerated. So the evidence suggests that I was not merely in a state of functional over-reaching from which the body bounces back with renewed vigour after a brief respite. I had almost certainly over-trained. I was in need of a more profound rest. Yesterday, I ran 11 Km, the longest distance I have run in recent times. My pace was very slow – around 6:30 min/Km – but for the first time since September, my legs did not ache. I hope this indicates that I have now passed the nadir, and can again begin re-building, but very cautiously. Arthur Lydiard’s simple dictum, ‘miles make champions’ is undoubtedly true. Indeed the rapid crumbling of my fragile fitness base as I have cut back the training volume since September confirms the crucial role of training volume. But just as every wise proverb can be countered by one that draws the opposite conclusion, miles can also undo would-be champions. In the summer, the most striking contrast with my training of recent years was the much greater proportion of long runs, mainly at a quite slow pace. I think it is likely that I did too many long runs this year. As I discussed in a post in October, Dudley’s studies of rats who ran at various intensities for various durations, showed that the increase in the mitochondrial enzymes that are essential for aerobic metabolism reaches a plateau after a sufficiently long duration of running. The plateau was achieved late, and was highest, in the rats that ran at the modest pace of 30 metres/min which they could maintain comfortably for over 90 minutes. A somewhat faster pace of 40 m/min, which was near to the peak pace that they could maintain for 90 minutes, produced a slightly lesser gain in aerobic enzymes. Paces below 30 m/min achieved an even lower plateau. On the other hand, at paces faster 40 m/ min the gains in fitness were more rapid but the duration for which the animals could sustain the pace was less and consequently the total gain in fitness was less than that achieved at 30 m/min. Rats differ from humans in many respects, and the actual paces of animals with legs of only a few centimetres in length are of little relevance to humans, but the muscle physiology of rats is essentially similar to ours. It is likely that similar principles govern the effects of training. There appear to be two major conclusions. First, the greatest gain in aerobic capacity is achieved by a ’good aerobic pace’ that can be maintained comfortably for 90 minutes. Second, there is a limit to the benefit in aerobic capacity obtainable by increasing the length of training sessions. There may be other benefits of long runs, such as strengthening of connective tissues. But the occurrence of the plateau in development of aerobic enzymes suggests that at that beyond around 90 minutes something inhibits the further development of aerobic enzymes. Perhaps the most plausible limiting factor is the accumulation of cortisol. Skoluda and colleagues have demonstrated that endurance athletes exhibit a sustained elevation of cortisol, and furthermore, the magnitude of the increase correlates with greater training volume, measured in either hours per week or distance per week. Cortisol is a catabolic hormone that promotes the breakdown of body tissues, including muscle, while inhibiting the synthesis of new protein. To evaluate the plausibility of the proposal that cortisol limited the synthesis of aerobic enzymes in Dudley’s rats and also played a part in my mediocre half marathon and the subsequent crumbling of my aerobic base, it is necessary to re-examine some of the details of role of hormones in the regulation of energy metabolism discussed in the first of my posts comparing the Paleo diet with a high carbohydrate diet. At the commencement of exercise, there is an acute elevation of cortisol, together with adrenaline, that mobilizes the body’s resources to meet the demand for increased energy. The generation of glucose from glycogen is stimulated, thereby releasing the fuel that can be utilized most rapidly for muscle contraction. Cortisol also stimulates the metabolism of fats and of amino acids. Conversely, protein synthesis from amino acids slows down and body systems that serve longer term survival needs are put on hold. The immune system and the gut suffer first, though as long as the muscle continues to generate the amino acid glutamine, which helps sustain both immune cells and the lining of the gut, these body systems continue to function reasonably well. However, as the duration of exercise extends into the period when glycogen stores show signs of depletion, cortisol level rises further. Now the body’s priority is ensuring adequate supply of glucose for the brain. The increased level of cortisol inhibits the glut 4 carrier proteins that transport glucose into muscles. The muscles are increasingly reliant on the relatively slow production of energy via fat metabolism. Meanwhile, synthesis of glutamine drains the pool of intermediate metabolites that participate in the Krebs cycle, the closed-loop of metabolic transformations that plays a central role in energy metabolism and also in the synthesis of amino acids. Although fat metabolism can keep the Kreb’s cycle going, it cannot top-up the pool of intermediate metabolites. This topping-up requires input from pyruvate which is generated by the metabolism of glucose. In the absence of concurrent glucose metabolism, glutamine levels begin to fall, impairing the function of both the immune system and the gut. Thus, the immediate effect of the elevation of cortisol is the provision of fuel for exercise, but as glycogen supplies diminish the priority is provisioning the brain, and the rest of the body suffers. How long does it take for this to occur? Cook and colleagues recorded salivary cortisol levels in recreational runners both during and after a marathon. The highest level was almost 6 times higher than typical morning levels, recorded 30 minutes after completion of the event, but the level had risen steadily throughout and was already very high by 25 miles. Similar levels were recorded following a non-competitive marathon. Thus, an appreciable elevation of cortisol is likely even during long training runs, consistent with Skoluda’s finding that endurance athletes have chronic elevation of cortisol that rises in proportion to training volume. What are the potential adverse medium and long term consequences? The acute anti-inflammatory effect of cortisol is likely to hinder the repair and strengthening of muscles and other body tissues. In particular, the synthesis of aerobic enzymes is inhibited. Suppression of immune function creates the risk of infections. Sustained elevation of cortisol will sustain a balance that favours breakdown rather than building up of tissues, and thereby promote further loss of fitness. Furthermore, prolonged exposure to high levels of cortisol decreases the sensitively of the receptor molecules that mediate the effects of cortisol on body tissues, and might ultimately promote chronic inflammation, harming joints and connective tissues while promoting the deposition of atheroma in blood vessels. In my own situation, I suspect that a continuing bias towards catabolism rather than anabolism has hastened my loss of fitness, while the continued aches in my legs probably reflected chronic inflammation in the ligaments. On the other hand, I have been pleased to note that I have not suffered any exacerbation of asthma this year. I hope that any tendency towards increased formation of atheroma in my blood vessels has been minor. Next year, I plan to train for a marathon. But if I am to achieve a more robust fitness base and even more importantly, to enhance rather than harm my long term health, I need to adopt a different training strategy. I should start with a more careful scrutiny of the past year. While the most immediately apparent feature of my training during summer of 2013 was the relatively high proportion of long runs, a more careful inspection of my training log reveals a potentially more significant issue. After the resolution of arthritis in the early months of the year I had gradually increased my training volume up to 30 (equivalent) miles per week, and was coping well. Then, in March I increased the volume quite rapidly, by almost 15% each week for 4 weeks, up to 50 (equivalent) miles per week by early April. The submaximal test revealed that my fitness continued to improve fairly steadily until mid-April, but then suffered a slight decline in May, so I reduced the weekly volume back to 45 (equivalent) miles per week. Once again fitness began to improve, albeit slowly and I was feeling tired much of the time. I continued at that level of training until mid-August when I once again increased to 50 (equivalent) miles per week, but that produced only a marginal further increase in fitness by late September. At the time, it appeared that I had pushed myself to the limit but had not quite over-stepped the mark. However, in retrospect, I think I had overdone it. The damage was probably done in March and early April when I had increased training volume by 15% per week. At that time, all had appeared well, as my fitness continued to improve. Indeed from mid-March to mid-April I saw the greatest gain in fitness in any month of the year. It appeared I had got away with a relatively minor infringement of the 10% rule. But the increases in weekly volume reflected another feature, an increase in the number of long runs. By late April, I was occasionally slipping in two moderately long runs within a single week. I suspect I was accumulating a surfeit of cortisol that led to the transient decline of fitness in May, the mediocre half marathon in September and the subsequent devastating loss of fitness. I have about nine months until my target marathon next autumn. This gives me five months to build a solid base, leaving four months for specific marathon preparation. The cardinal goal of the final four months will be developing the capacity to sustain marathon pace for 26.2 miles. The goals of the preceding five months of base-building are more varied. First, I need to ensure that my connective tissues are well conditioned and free of any trace of lingering inflammation. I will need to adjust my training over the next few months according to how well the recent recovery is maintained. I will continue with moderately demanding weight sessions and some mild plyometrics. It is likely that I will do a greater proportion of my aerobic training on the elliptical cross trainer next year, and I will build-up the long runs very gradually, aiming to increase from the current 11 Km to 25 Km by late spring. Secondly I aim to develop the ability to utilise fat in preference to carbohydrate at low and mid-aerobic paces, thereby minimising the risk of excessive elevation cortisol during long training runs. The main element of the strategy to achieve this goal will be a gradual increase in training volume, especially in the low and mid-aerobic zones. I will also maintain my current nutrition, consuming a diet that matches the Mediterranean diet as described in my post two weeks ago. My third goal will be the development of aerobic capacity, including the ability to utilise lactate. The gradual increase of training volume in the low and mid-aerobic zones required to promote utilization of fat will also contribute to this goal. In addition, I will do regular sessions similar to Hadd’s 25×200/200 sessions, in which brief epochs that are effortful enough to generate a modest amount of lactate, alternate with recovery periods long enough to allow the metabolism of the lactate. Because there is minimal accumulation of acidity the session is only moderately stressful. Fourthly, I will attempt to build up the strength to maintain a reasonable marathon pace without the need to increase cadence to an inefficient level. At present, my cadence exceeds 200 steps per minute even at 5 min/Km. My strategy for developing the strength required to lengthen my stride includes a mixture of short hills, long hills and sprinting in addition to weights and plyometrics. A key feature of all of these sessions will be generous recovery after each effortful epoch, to maximise the stimulation of anabolic hormones and minimise cortisol production. Above all these specific goals, I will aim to start the marathon specific training in a robust and relaxed state.